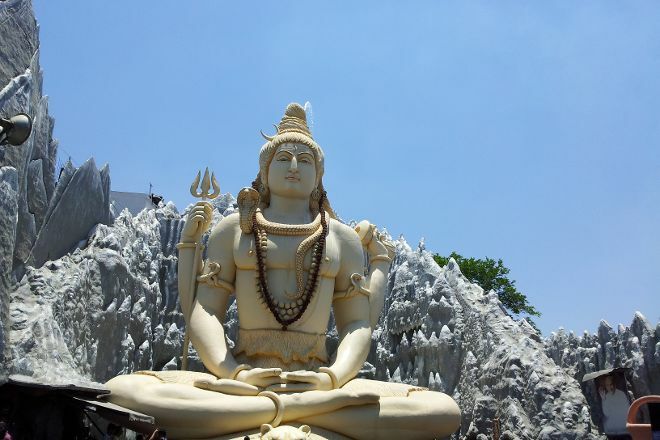 Shivoham Shiva Temple, recently built in 1995, is rumored to hold the most powerful Shiva statue in the world. Due to the gigantic idol, thousands of devotees visit each year to pay their respects at the temple, whose creation itself is a bit of a marvel. Ravi V. Melwani, founder of the temple, hired a sculptor named Kashinath, who molded the statue with his bare hands, without a plan or measuring tool. At the entrance, find the largest Shiva Linga gate in the city. Farther in, find a Lord Ganesha statue as well as two bell towers that make the location of the healing stones, which are said to have miraculous healing powers. Make Shivoham Shiva Temple a centerpiece of your Bengaluru vacation itinerary, and find what else is worth visiting using our Bengaluru visit planning website . I wanted to see the giant Shiva once, and it came in the family. It enters from the entrance of a slightly strange, black building on the main street. When I entered, I felt like I was already away from some religious thing, and my child was mistaken for coming to the cinema. You can pray for 250 rupees per adult. Sunday afternoon was easy to see and not crowded. The staff were very nice. Although the Hindu was of course seriously puja, it was a temple that came without hesitation even by the religious person. I take off my shoes at the entrance. Also, when I bought a ticket, I gave me a bag containing a CD, but one bag was enough for my family. This is good for one time visiting. You will feel good here. However, most commercial temple in the Bangalore. Basically, this is not a temple. Beaware, ask the tickets Rs 50 for entry only. Otherwise they will give you Rs.150 per head. If you are going there for pray purpose. Peaceful It is a small and a beautiful temple with a feeling of Himalayas around. This tall and beautifully structured Shiva idol is the main attraction of the temple. The pathway to it is very dark and long and it looks like a tunnel that you have to pass through reach the Shiva idol. Water falls from his hair and you can actually feel the drops and mist in the premises. Temple of Lord Shiva. A huge statue of Lord Shiva siting in meditation position is been erect here. Just situated in well approachable location, focuses on all holy location of Lord Shiva and benefits of meditation. One can buy passes for various pooja and attraction.. At last can sit in front of Lord and feel all positive vibes around. Must visit place. Its a beautiful place.. ❤ You should surely visit.. For peace of mind.. But if you want to view the whole temple you have to pay rs. 250 .. Or else you can only see the outer side of the temple..
Place is good. But they are running a templr for business. If you pay 250Rs you can easily go inside. If you don't want to pay then they will.make you walk a lot. Even when temple is not at all crowded. Every day, we help thousands of travelers plan great vacations. Here are some tips on how to use your Listing Page to attract more travelers to your business - Shivoham Shiva Temple. 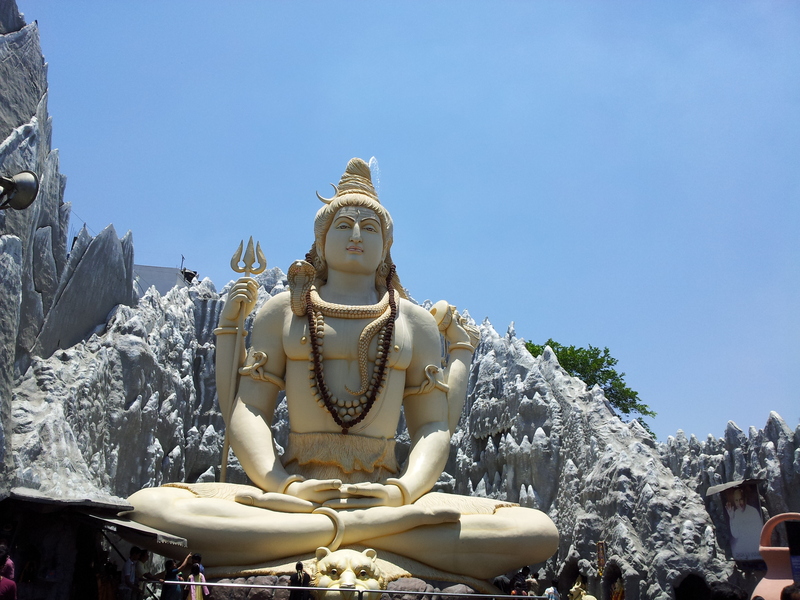 Promote your permanent link - https://www.inspirock.com/india/bengaluru/shivoham-shiva-temple-a446333819 - on your website, your blog, and social media. When a traveler builds a plan from this page, the itinerary automatically includes Shivoham Shiva Temple. This is a great way for travelers looking for a great vacation in your city or country to also experience Shivoham Shiva Temple. Promoting your link also lets your audience know that you are featured on a rapidly growing travel site. In addition, the more this page is used, the more we will promote Shivoham Shiva Temple to other Inspirock users. For best results, use the customized Trip Planning Widget for Shivoham Shiva Temple on your website. It has all the advantages mentioned above, plus users to your site can conveniently access it directly on your site. Visitors to your site will appreciate you offering them help with planning their vacation. Setting this up takes just a few minutes - Click here for instructions.